Enjoy recipes, photos and stories from Cabot's Farm Families. Simple, wholesome dishes from America's best dairy farms. 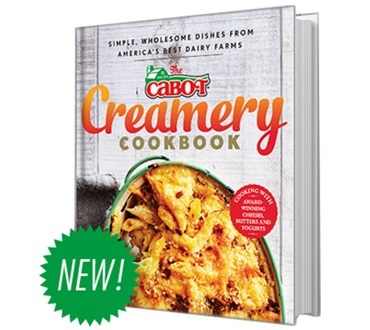 The Cabot Cookbook is an honest-to-goodness collection of recipes and stories from real dairy farmers, who have always understood that good food begins with great ingredients. This rich collection of 150 irresistible and easy-to-follow recipes, ranging from appetizers to desserts and everything in between, will tickle the palates of home cooks everywhere. I love this cookbook! It has a variety of recipies that are easy to follow. The book becomes more charming by the family farm stories throughout it.